Mussels Gratiné, Thyme for Cooking easy seafood. Mussels are more traditionally served in black iron pots, with about 2 lbs per person. You can get them with just white wine, or add cream, curry sauce or tomatoes. This is a little nicer presentation and a good introduction if you've never fixed and/or had them before. You can eat them with a fork or just slurp them out of the shell. Dump the mussels into a dry sink and look at them. Any idea what to do with them? I didn't the first time, but we learn. First thing, after the clattering in the sink (I meant 'dump' literally) they should all be closed. For any that are not, tap lightly on the shell. If they don't close throw them away - they are already dead and we don't want them. If they are not cleaned (ask the fishmonger - lovely word, that... they probably are where you live - not for me) they need the barnacles (lumpy bits) scrubbed off with a brush and the beards - the stringy bit hanging out of the shell that they use to attach themselves, pulled off. Just grab and pull toward the hinge. Once they are cleaned, sort through them tossing any that are very tiny (not worth the effort) or seem heavier than they should be (probably full of sand). Set mussels aside - well done! You don't have to be perfect with the cleaning... many people don't bother! Heat wine, bay leaf, thyme and 2 whole garlic cloves in large pot with a tight-fitting lid over high heat. When wine is boiling dump in the mussels and cover. Reduce the heat to medium and give the pan a shake every minute or two. Uncover after 3 minutes - if most of the mussels are open remove from heat. If not, cover and give them another minute. When done, pour mussels into a colander over a large bowl to catch the cooking liquids. Strain cooking liquid and set aside. Discard any mussels that did not open. Sauté over medium heat in 1 tbs olive oil in a large nonstick skillet until transparent. Drain tomatoes and roughly chop. Add to skillet and sauté 5 minutes. Back to the mussels: using only the open mussels, break off half of the shell and place the mussel in its half-shell in a baking dish, 8 X 10 (20 X 25cm), 9 X 13 (22 X 30cm), whatever works; they should just fit. 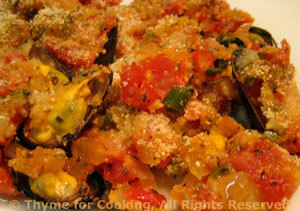 Spoon tomato sauce evenly over the mussels, sprinkle with bread crumbs and drizzle with remaining tbs olive oil.